This behind the scene footage of our shoot for Nitro Circus is narrated by the one and only Pepper, aka Mayor of Skid Row aka Leader of the Homeless. 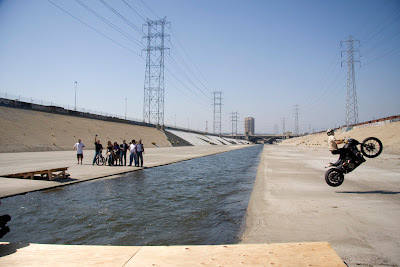 While he shares his thoughts Roland Sands and Andy Bell jump the L.A. River! Click here to view more photos of the Nitro Circus shoot! MTV’s Nitro Circus is a television show featuring highly skilled, adrenaline-fueled mad men. Some would say this motley group has a death wish.. maybe. This week’s episode will feature Roland and the Nitro Crew thrashing the RSD stable of bikes in the LA River. Watch Roland and Andy Bell attempt to jump the LA river on Big V Twins! Take a peek at this week’s all-new episode, airing Thursday at 10PM ET/PT on MTV.